“Free” Service or “Good” Service: What Attracts Users To Public Access Computing Venues? What does the existing academic literature and research suggest in terms of how user fees affect ICT use in public access venues? The impact of user fees in public access venues has been only slightly investigated, especially in public libraries and telecenters, and, again, the findings are often country and venue specific. Most of the existing literature, while revealing user behavior before and after fees are introduced, does not come to any solid conclusions about whether or not fees are detrimental to venue use (Adomi, 2005; Best, Kolko, Thakur, & Aitieva, 2007; Salvador, Sherry, & Urrutia, 2005). One work that illustrates this finding is Egholm and Jochumsen’s article, “Perceptions Concerning User Fees in Public Libraries” (Egholm & Jochumsen, 2000). The article outlines several public library systems that charged user fees, and offers some findings about user attitude towards fees in public libraries. In many situations, the authors note, it is not possible to identify explicit relationships between the impact of user fees on library membership and use. Even when looking at ex-public-library users, studies have shown that user fees were of little consequence in determining library use. In exploring user-fee subsidies in Kyrgyzstan telecenters, Best, Thakur, and Kolko found that distributing waivers for user fees, essentially making telecenter use free, did not increase use of ICT in telecenters among underrepresented social groups (Best, et al., 2007). Additionally, the authors found that users who reported economic benefits from using the telecenter did not take advantage of the user-fee coupons. The methods in which public access venues charge user fees vary. One model, popular in cybercafés and telecenters, is per-transaction, or pay-per-use, fees where users are charged by the minute or hour of ICT use. Another model is a subscription-based fee system, where users are charged for ICT use through a weekly, monthly, or, most commonly, annual fee. In looking at rural computer kiosks, a form of public access to ICT, Kuriyan and Toyama found that user perceptions of fees differed depending on which model was employed through user and non-user interviews – the authors assert that annual fees or subscription-based models, either as explicit ICT subscriptions, or included in another subscription (e.g., farmer cooperative membership fees), are more widely accepted by users, while many users and non-users alike feel that per-transaction rates are too high (Kuriyan & Toyama, 2007). Given the literature’s lack of concrete conclusions around the role user fees play in venue use, we took a look at another characteristic of venues that emerged as an important factor in the results of this study: the role of venue staff. We discussed the role of venue staff as infomediaries in Chapter Three. As noted in that chapter, as infomediaries, staff in public access venues can be evaluated on their digital literacy and willingness to help users as a measure of their impact on ICT use. In their overview of literature and research on public access to ICTs, Sey and Fellows write, “infomediaries…have been found to be important contributors to the viability and sustainability of a public access venue, helping attract users to the site, and providing guidance and guiding users unfamiliar with ICTs” (Sey & Fellows, 2009, p. 7). Other literature also suggests that venue staff is critical in user experience of the venue and its overall sustainability (Best & Kumar, 2008; Bossio, 2004; Ulrich, 2004; Whyte, 2000). 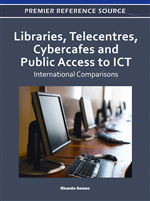 While the literature and research currently available suggests that charging user fees for ICT access may not be detrimental to the success of a public access venue, most of the literature places particular emphasis on staff training and helpfulness, as well as availability of content, as the key drivers to ICT use.